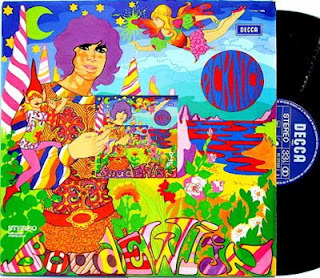 Looks like "The Fool" collective (who were Dutch but in the UK doing stuff like Clapton's guitar and the 2nd Incredible String Band cover and The Beatles Apple shop front) did that artwork. According to me, big brassy fanfares made this record very enjoyable !! Does any of dutch visitors can include english translation of lyrics ? Im pretty curious..
...and yet, I must offer thanks again for your posting this, as I LOVE artwork 'The Fool' group did, and had never seen this cover before. he's not an underground figure, though. already from the beginning of his career he was very popular in holland and belgium. these days he plays in a belgian soap about cops. great record! "I love Nederbeat stuff where Dutch people sing in broken English, but their own language, not so much..."
Dutch sounds absolutely charrrrrming in my Finnish ears! I think I would never learn to pronounce those most exciting soundings properly. or a f*cked up version of the song. I agree with Excellentie Punanius Caput. I was just looking at an English translation of Boudewijn's songs and the meaning gets so garbled. I grew up with Dutch parents and relatives and am both US and Dutch citizen. I know the Dutch language, by ear, very well but only speak it passably on the street. Though the English version of Eva is obviously not totally correct, it helped me when i could not understand some parts of the song on CD (can't rewind and listen again and again to get it). Eva is such a beautiful song, about God creating the earth, he being the artist. I was trying to find the Dutch words for the woman who is singing in Travestie, but the lyrics just show Boudewijn's part. Is there a complete Dutch lyric available? I have listened to Boudewijn's greatest hits CD so often now that I would love to see him play live if possible. Is he touring in 2010? You Tube has some great BdG performances. You should view the one for Prikkebeen, filmed black and white in 1966 - so cool! for those. Some more some less. There are actually some dates available.